In the realm of tooth replacement, dental implants are clearly in a class of their own. Compared to traditional bridges and dentures, dental implants offer the most natural-looking, reliable, and durable solution to the problem of missing teeth. With them, Dr. Katherine Whitaker can help a patient close the gaps in their smile for a lifetime, rebuilding their confidence and oral health at the same time. Are you ready to enjoy your complete smile again? If so, give us a call today to schedule your implant consultation. Why Choose Corbin Family Dental Care for Dental Implants? The reason dental implants are so special is because they are the only treatment that replaces an entire missing tooth both above and below the gum line. An implant is actually a prosthetic tooth root that is placed directly into the jawbone, establishing a firm foundation for the new teeth that show within the smile. Because they’re able to stand on their own, they don’t put stress on the surrounding teeth and gums like other replacements. The roots even provide internal support for the jawbone, which helps prevent and even reverse the bone loss that is so common after tooth loss. The roots themselves are primarily made of titanium, and the restorations are made from a high-quality dental ceramic, so they are truly built to last. Often, dental implants have been shown to last for 30 years or more! In addition to looking more natural than regular bridges and dentures, they also bring back more function to a patient’s smile, enabling them to eat pretty much whatever they want without having to worry about a prosthetic moving around in their mouth. 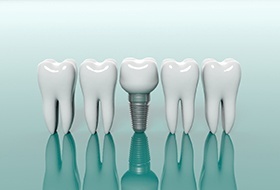 Dental implants can be used to replace any number of teeth using a variety of restorations. At Corbin Family Dental Care, all of our implant restorations are designed to ensure they fit comfortably in a patient’s mouth while giving them a smile they’re proud to show off. 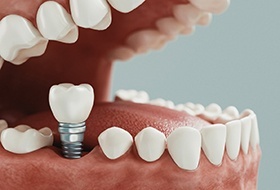 In the case of a single missing tooth, Dr. Whitaker will attach an all-porcelain crown directly to the prosthetic root using a connector called an abutment. Because this tooth will have the same two-part structure as those surrounding it, only you and Dr. Whitaker will know that it is not real! For patients missing multiple teeth in a row, two implants can be placed on either side of the gap to support prosthetic teeth to fill it, creating a bridge. Implant bridges are more secure, last longer, and provide better function than their traditional counterparts, plus they don’t have a telltale black line near the gums. Multiple implants can even be strategically placed into the jawbone in order to secure a denture. Compared to traditional removable dentures, implant dentures are much less likely to slip and slide within the mouth, plus they restore much more of a patient’s bite strength, enabling them to enjoy more foods with ease. In order for a patient to get dental implants, they must first undergo a minor surgery in which the new roots are placed into the jawbone. To guarantee that our patients receive only the highest level of care, Dr. Whitaker has partnered with a network of local oral surgeons and periodontists that she personally knows and trusts. Thanks to their specialized expertise, patients can look forward to an easy and seamless implant process from beginning to end. After the placement procedure has been completed and a patient has been given time to heal, they will return to Corbin Family Dental Care to have their implants restored by Dr. Whitaker. Dental implants are quite versatile and can meet the needs of patients with varying degrees of tooth loss. Because of this, the overall cost of the procedure (which is broken up into two phases, placement and restoration) can vary quite a bit from person to person depending on their particular needs and goals. Factors such as how many teeth a patient wants to be replaced, where they are located, and what kind of restoration they want can all influence the final price. 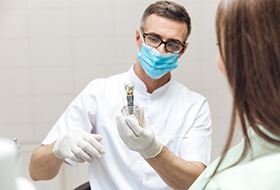 While dental implants often do cost more upfront than other replacements, they tend to be the better investment over time thanks to their longevity. Traditional bridges and dentures normally require periodic maintenance and complete replacement every 7-10 years, while dental implants can easily last for 30 with just simple brushing and flossing. This can literally save a patient thousands of dollars over the course of their lifetime, plus the esthetic and health benefits provided by implants simply can’t be matched by other options.